My pantry is a hot mess right now. I’m almost lost when it comes to deciding how to handle it, which is out of character for me. I did what any self-respecting working mama would do…I hit up Pinterest! The ideas I gathered on Pinterest were so awesome, I knew I had to share with you all. I was drawn to this picture because this pantry and mine are similarly shaped. I love the baskets and glass, and how the food items are stored and grouped. This makes for a very cohesive look. This is a smaller pantry. My pantry is a walk-in, but there are so many ideas from this picture I can use. I love those baskets the fruit is stored in, and I really like those jar labels. This person really made a great use of the space, too. There’s a lot of stuff in this pantry, but it doesn’t look cluttered. Those matching containers. Those baskets! Those storage bins! The use of space! Do you notice a trend here yet? I like all of the same things about this pantry, but I especially like how this pantry is organized using materials you can find in any store. You wouldn’t have to spend a lot of money to do this, either. What about this lovely pantry doesn’t say “farmhouse?” I love everything about this. Those labels and wire baskets are super cute!! Here’s another small spaces pantry. I liked this one because I liked those leather-look tags and aged labels. Aren’t they cute? They say our Pinterest boards are a good indication of what we want our own home to be like. Based on my Pinterest roundup, it seems my pantry needs a little more organization, a more cohesive look and I need to make better use of the space. Stay tuned: next week I’ll show my pantry…in all of its chaotic, messy glory. I bet you’re thinking, “Well, that picture doesn’t look very organized.” You’re right. That is the before picture. 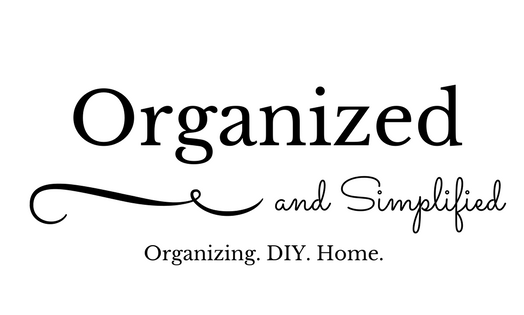 Now that I’ve got your attention, let me tell you how a sheet of pegboard, some bins and baskets, some lumber, and some spice racks totally changed my creative space. I keep my craft supplies in a tall TV cabinet that I bought on Craigslist for $100. I have for a long time wanted a Workbox, but at almost $2,000 a pop, I just can’t justify the expense. So I make do with my $100 Craigslist special. I love this cabinet, as it just looks like a piece of furniture in my office…but I didn’t love how chaotic and disorganized it was. And the cabinets on the bottom? They weren’t too bad, but not too great, either. Just like a lot of things in our house, the craft cabinet started off great but then fell into disorder. Boo. I decided even if I can’t have a Workbox, I can borrow some of the ideas I like from it. One of those was storage in the door. I’d already attempted this, but not too well. I immediately decided pegboard would be a cheap and easy way to do this. I bought pegboard, a set of pegboard baskets, a set of plastic pegboard bins, and some plastic pegboard hooks. I knew I’d have to mount the pegboard on 1x4s to keep the screws from going through the outside of the cabinet. Luckily, I had some left over from a recent project. I added pegboard to both cabinet doors and painted it white. I then added our bins, baskets and hooks. I hung up washi tape and ribbon using dowel rods. I repurposed those spice racks I had used before. I also added a shelf inside the actual cabinet. I already had the boxes and bins. Let’s take a look at that before and after once more, shall we? It’s not perfect and it could still improve, but at least my toes are safe from wayward cans of wood stain. Comment below and show me your creative spaces!! And have a great weekend.